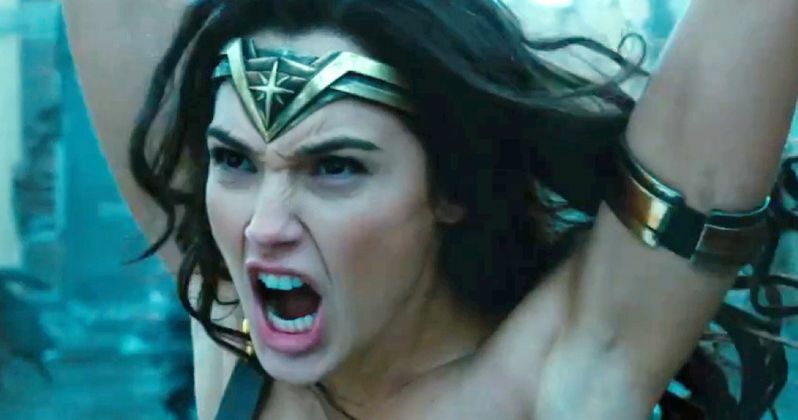 Best watch yourself, misogynist sexists, because Wonder Woman isn't playing nice anymore. Gal Gadot isn't just saving the world as Wonder Woman, she's taken the fight to the real world and is standing up against those in Hollywood who have sexually harassed men and women in the industry. Now, in a new interview, she says that their wrath is over. And she's not playing around. Gal Gadot is currently making the rounds promoting Justice League, which arrives in theaters this weekend. Recently, Gadot and her co-star Ezra Miller, who stars as The Flash, interviewed one another. For the most part, it was a silly, fun interview. However, at one point, Miller prompted his co-star to deliver a message to the "hetero patriarchy." At that point, Gadot looks into the camera and, with Ezra Miller excitedly cheering her on, she had this to say. "I'm just going to say, misogynist sexists, your wrath upon this world is over." It's a serious moment, done in a lighthearted way, but an important thing for Gal Gadot to say. Wonder Woman proved this year that the world at large is ready to accept female heroes, as the movie dominated at the box office all around the world. So having the woman who brought the beloved DC hero to life declaring that these detestable people, who have been getting away with sexual harassment behind-the-scenes in Hollywood for decades, are at their end, is impactful. It's been made clear that Gal Gadot is not willing to put up with anyone who's been associated with sexual misconduct in her career. Brett Ratner, who's RatPac-Dune Entertainment produces Warner Bros.' DCEU movies, was recently accused of such misconduct by actresses like Ellen Page. Warner Bros. has since cut ties with Ratner but, as of this writing, Rat-Pac-Dune is still a partner on movies like Wonder Woman 2. Though the studio denies it, a recent report states Gadot won't do the movie if Ratner is in any way involved. When the Harvey Weinstein scandal, which prompted this tidal wave of change in Hollywood, first broke, Gadot had this to say. "Bullying and sexual harassment is unacceptable! I stand by all of the courageous women confronting their fears and speaking out. Together we stand... We are all united in this time of change." Wonder Woman 2 recently had its release date moved up, but it's important to note that her initial contract ran out with Justice League. So if Warner Bros. doesn't stand as firmly against these "misogynist sexists," she's probably willing to walk away and can walk away. But the fact of the matter is that Gal Gadot is far more important to the DCEU than Brett Ratner, or anyone else who's been accused of such misconduct. Those who have been upset by recent events can rest assured; Wonder Woman is right there with you. Be sure to check out the full interview with Ezra Miller and Gal Gadot, courtesy of the IGN YouTube channel, for yourself below.